Paths for Communities 1 at Marston MoretaineWalking RouteA pleasant walk that leads you through the Millennium Country Park and surrounding countryside to the Georgian market town of Ampthill, then onto the attractive village of Millbrook. The Forest Centre is just off the A421 at Marston Moreteyne and is only a few minutes from Junction 13 of the M1. Just follow the brown tourist signs marked Forest Centre. Parking is available at the Forest Centre, at the Greensand Ridge car park in Millbrook and at Ampthill Park in Ampthill. 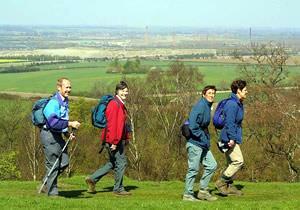 This circular walks starts and finishes at the Forest Centre at Marston Moreteyne. A pleasant walk that leads you through the Millennium Country Park and surrounding countryside to the Georgian market town of Ampthill, then onto the attractive village of Millbrook.